Left to right: Tibicen, Gabrielle, Gisele, Isolde, Udalrich, Rosa, Laenus, Alison, Lilias, Godith. 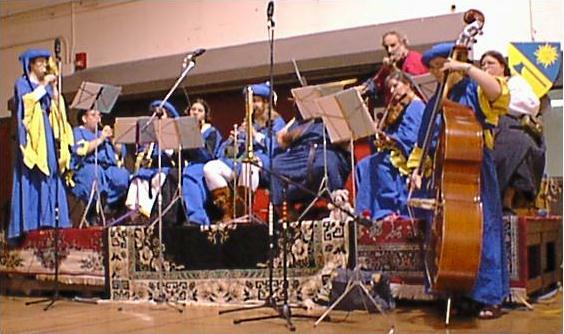 The Waytes of Carolingia are the municipal Renaissance dance-band for the Barony of Carolingia, and the major instrumental subsection of the Carolingian Guild of Musicians and Jongleurs. In accord with our purpose as part of a Carolingian guild, we bring music to SCA events. Primarily, we play for dancing, but we also occasionally do other projects, such as competing the Polyphonic Challenge at Pennsic (we've won the instrumental category twice). We also occasionally do professional gigs outside of the SCA as fundraisers for the guild. The Waytes' Repertoire (2012 version). The gig log (not currently maintained, but may be of historic interest). Barony of Carolingia web site. Last modified by Ysabel, 6 April, AS LIII (2019 C.E. ).